We look at the pipeline constraints impacting Russian flows into European hubs this winter and how these may be alleviated over the next 5 years. As winter approaches the European gas market is looking east. A tight market increases the importance of Russian flows to maintain orderly hub prices and security of supply. Gazprom has ample production capacity to ramp up exports to Europe, supported by 80+ bcma of ‘shut in’ gas in Western Siberia. But there are some key pipeline capacity constraints that impact the flow of Russian gas into the interconnected European hub network. Daily deliverability will be a key factor impacting the gas market across the next two winters. From 2020, the commissioning of new pipelines should ease deliverability issues shifting the focus to growth in annual Russian import volumes. In this article we put some numbers around how much capacity headroom exists against both daily and annual constraints. We also look at the impact of new pipelines in alleviating these constraints. Chart 1 shows the evolution of daily flows across 2018, for the key European border entry points associated with these routes. Source: Timera Energy, ENTSOG (note Nordstream has been achieving flow rates above nominal capacity). 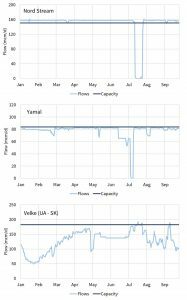 The simple conclusion here is that Nordstream and Yamal have been flowing at or very near to maximum capacity across 2018. That means there is very little incremental capacity to provide either daily deliverability or annual flow volume upside. As a result, import flexibility is now focused on Gazprom’s less favoured Ukrainian flow route. This route has also hit daily flow constraints a few times across summer 2018. However there is at least 10 bcma of annual flow upside. Daily deliverability is the key issue this winter. It is not hard to construct a set of circumstances where deliverability of Russian gas into European hubs is constrained across a number of days (or potentially weeks) e.g. due to a cold weather pattern or supply outage. Both these mechanisms are relatively unresponsive to price (i.e. supply is inelastic in the short term). And if this situation arises it may result in major hub price shocks and volatility (reference the ‘beast from the east’ shock in Mar/Apr). Capacity is likely to remain tight for the next two winters. But work is underway to alleviate the flow constraints for Russian gas into Europe. The TAP pipeline from Greece to Italy, the final link of the new Southern Corridor route into Europe, is due be commissioned in early 2020. TAP in theory opens up another 10 bcma of flows that could displace gas flowing south into Italy via TAG (from Baumgarten) and Transitgas (from TTF/NCG/PEG). But contractual positioning is likely to mean only some of this will actually occur. The real game changer is Nordstream 2. And it is precisely this reason that this project will almost certainly go ahead. Europe may not like increasing its dependence on Russian gas, but Nordstream 2 is effectively a free option on security of supply. String 1 (27.5 bcma) is likely to come online in early 2021, with String 2 (same volume) online in early 2022. 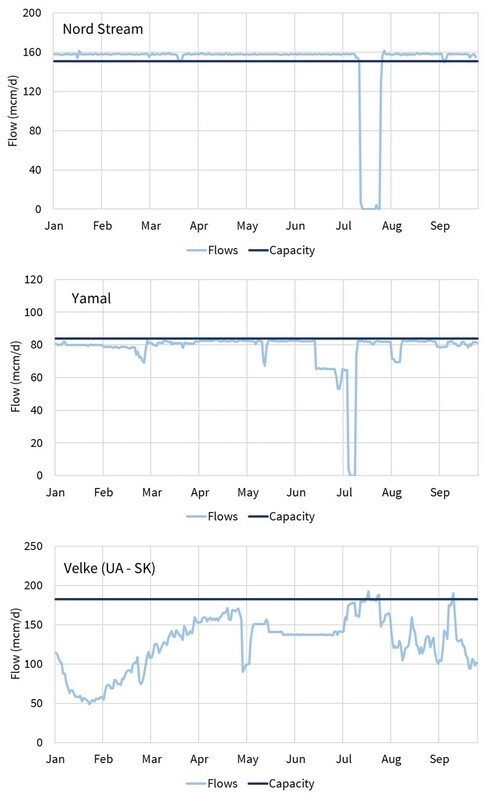 Chart 2 shows current annual capacity headroom based on a comparison of projected 2018 flows versus available capacity across the 3 existing routes. 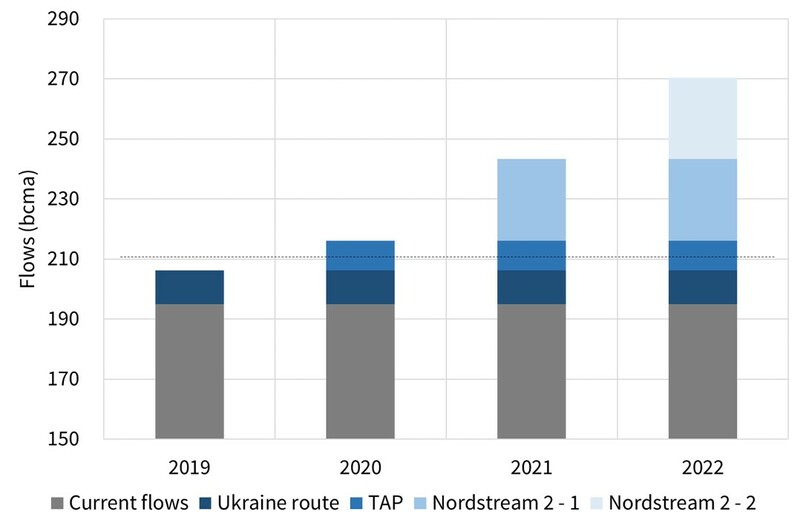 The chart also illustrates the potential impact of the TAP and Nordstream 2 pipelines in raising capacity headroom. It is important to note that not all of the annual capacity headroom in the chart is necessarily accessible. Flows on certain pipes may vary across seasons (e.g. be constrained in winter but not in summer) which can reduce annual flow potential. There are also contractual & logistical constraints that can impact full utilisation of available capacity (e.g. as described for TAP above). Tight capacity headroom on marginal sources of supply is a catalyst for price volatility. So watch out for potential fireworks across the next two winters (18/19 in particular). 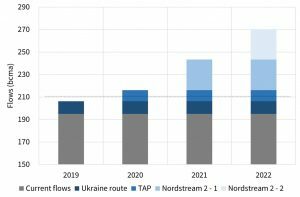 From 2021 capacity constraints are likely to ease rapidly with Nordstream 2. That potentially opens the door for significant growth in Russian imports up towards 250 bcma.